I thought I might start a wee series of these. 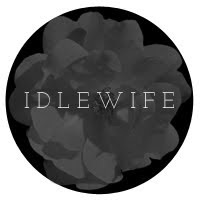 Idle Husband is originally from Greece, so every once in a while he'll come across a Greek word that we use commonly that just happens to translate hilariously in english. It hasn't happened that often, but when it does, we can't get enough of it. Oxi Clean. Oxi (pronounced 'oh-hee' in Greek) means 'no.' So something that we've come to understand as "this gets your stuff clean" actually means 'no clean' to Idle Husband. It's really hard to look beyond the 'no clean' thing now that I know.